Many of his old customers consider him a close friend or favorite uncle they love spending time with when in town. But then, Edward is the epitome of the perfect gentleman: calm, elegant, courteous, hospitable, and charming. He’s also renowned for his encyclopediacal knowledge of cigars and their accoutrements. He’s a long way from Iran, from which he and his family had to flee during the revolution in 1978. “We originally came here for Christmas, which we weren’t allowed to celebrate at home,” explains Edward, whose father opened the first breweries in Iran during the days of the last shah. At first he thought the move was temporary but soon realized that he had to start all over again. When asked by his solicitor and good friend what he’d like to do, Edward said that he wanted to open a Davidoff shop in London and sell fine cigars. He used to fly to their shop in Geneva to stock up. The solicitor then contacted Davidoff, which resulted in Edward’s meeting Dr. Ernst Schneider, the company’s president, and Raymond Scheurer, in London. It was agreed that Edward would open what was then the second Davidoff franchise in the world, after Hong Kong, and the first in Europe. The great story of the store’s foundation is unlikely to be forgotten by Edward’s family, especially his son, Eddie, 43, who, in recent years, has taken over the reins of the business from his father. If you’re going to smoke, smoke the best. “When Eddie was 16 my wife and I discovered he was smoking cigarettes,” recounts Edward. “So one day I gave him some friendly advice: If you’re going to smoke, smoke the best.” The father cut and lit his son a Davidoff No. 2 cigar, which he thoroughly enjoyed. 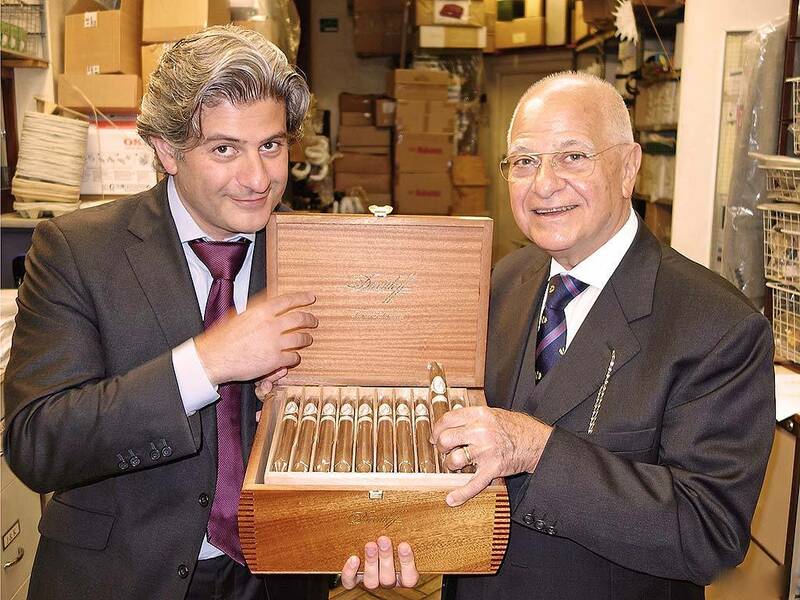 In May 2012, Eddie opened the first Edward Sahakian Cigar Lounge, in the Bulgari Hotel in Knightsbridge, at their request. In the meantime, he has also added 21st century communication and technology to the family business, including Facebook, Twitter, and YouTube, and is about to launch the company’s own website.